An interview with the author on New Books Network. Veins of iron run deep in the history of America. Iron making began almost as soon as European settlement, with the establishment of the first ironworks in colonial Massachusetts. Yet it was Great Britain that became the Atlantic world’s dominant low-cost, high-volume producer of iron, a position it retained throughout the nineteenth century. It was not until after the Civil War that American iron producers began to match the scale and efficiency of the British iron industry. 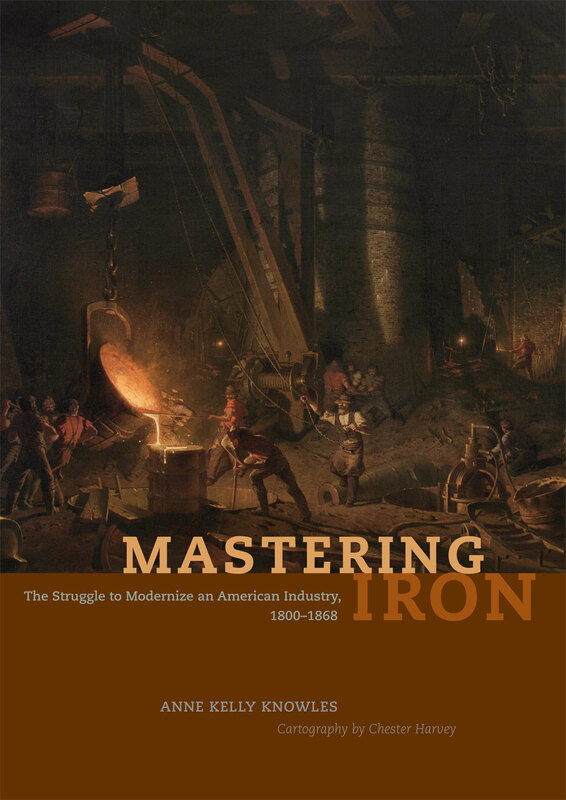 In Mastering Iron, Anne Kelly Knowles argues that the prolonged development of the US iron industry was largely due to geographical problems the British did not face. Pairing exhaustive manuscript research with analysis of a detailed geospatial database that she built of the industry, Knowles reconstructs the American iron industry in unprecedented depth, from locating hundreds of iron companies in their social and environmental contexts to explaining workplace culture and social relations between workers and managers. She demonstrates how ironworks in Alabama, Maryland, Pennsylvania, and Virginia struggled to replicate British technologies but, in the attempt, brought about changes in the American industry that set the stage for the subsequent age of steel. Richly illustrated with dozens of original maps and period art work, all in full color, Mastering Iron sheds new light on American ambitions and highlights the challenges a young nation faced as it grappled with its geographic conditions.